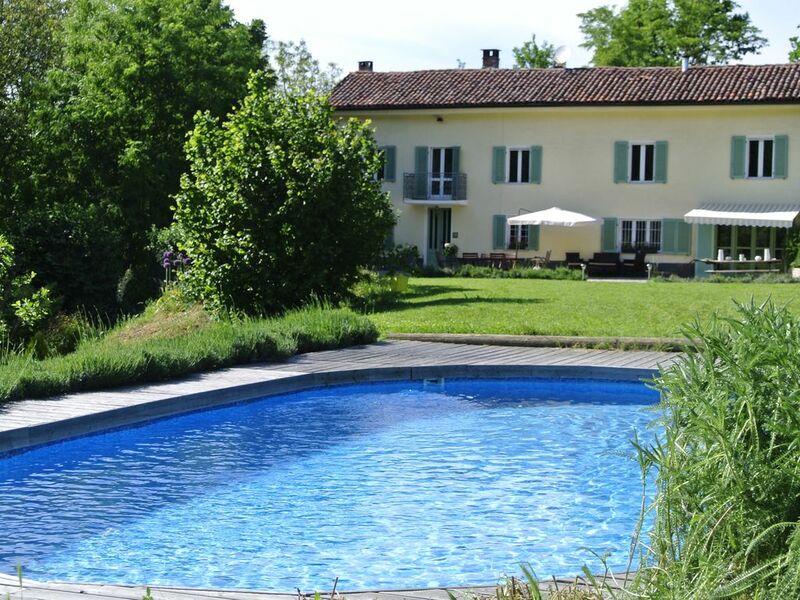 Cascina Caterina is our lovely holiday home. It is a chic C19th farmhouse in the verdant heart of Piedmont, famous for its beautiful countryside, vineyards and all things foodie. It's perfect for families - secluded and relaxing with an acre garden and pool, but not isolated. The best-ever pizza restaurant is down the road, and it's well-placed for trips to the Ligurian coast (1.5hr), historic Turin, Milan & designer outlet shopping, wine-tasting and some of Italy's top restaurants at Alba. We have recently bought our gorgeous farmhouse. It is already a lovely, comfortable place to stay and we're only going to make it better. This year we're offering it at a bargain price. There are four double bedrooms, two with king-size and two with double beds. All have views over the garden and woods beyond. The main bathroom on the first floor has a large bath and wet room-style shower; there are two more, one on the ground floor and one on the first floor. The kitchen is fully equipped with oven, hob, microwave, wood-burning range and two fridges with freezer space. There is a washing machine in the downstairs bathroom. The garden is large with peach, apple, pear and plum trees and is open to oak-filled woods that front the house. It's not a manicured space, so great for running around and playing. The pool isn't large (4.5m x 9.15m x 1.25m deep), but a great space for chilling together as a family. There is a parasol and outdoor seating on the courtyard, a barbecue, plus another parasol and loungers in the pool area. I live in London, so you'll need to be a bit self-sufficient, but I'm always happy to talk via phone and email. Plus Marta, who'll greet you, is English-speaking and lives locally. This is an idyllic place for children but please note that the pool and garden are not enclosed so supervision is important outside. There are no child gates on the stairs. Well-behaved dogs are welcome but must be supervised and cleaned up after AT ALL TIMES. There is no fence around the property. The farmhouse is reached via a short private road, which is unsurfaced, but you don't need a four-wheel drive, just drive very slowly. You are within walking distance of the village of Belveglio which boasts a bar, shop and the best pizzeria in the area. The nearest supermarket is a five-minute drive. All around you is rolling countryside chequered with vineyards - they're a Unesco World Heritage Site. A 20-minute drive will take you to the beautiful city of Asti or the bustling non-touristy but equally charming town of Nizza Monferrato. Alba is 30-40 mins away; Turin is an hour. You will need a car to enjoy your stay properly. There is a parking area at the house. There is a bike in the farmhouse, which you can borrow. If you have ever wanted to sample country living in Italy, this home is the place to go. It's charming, well equipped kitchen and modern interior makes living there a pleasure. There is plenty of room for friends and traveling companions. The secluded location offers plenty of privacy. When you are outside there is hardly a sound and the evening dark skies are filled with stars. The nearby villages are tiny, but they have everything you need from local foods and wines. The surrounding Italian countryside is beautiful as you might expect!